One of the most challenging things in terms of helping someone develop is to wait patiently while they figure things out for themselves. We know this as coaches, and, over time, develop an increased capacity to wait rather than jumping in to help. At the Coaches Training Institute (CTI), we call this “holding the client Naturally Creative, Resourceful and Whole,” and it is one of the key cornerstones of our coaching model. Exactly. As they say in the field of neuroplasticity, if it fires, it wires, meaning that every time we do something or think about something, a neural pathway either is being potentiated or reinforced. We can think of it like creating a path in the snow—the first time through it’s just a few footsteps, but walk it again and again and it becomes a track and then a trail. Walk it enough, even a road. Learning is a process of making these neural connections stronger and more robust, and sustainable change means we need to practice the new neural networks over and over until they become more dominant than the older ones we wish to leave behind. In the brain, what this means in a practical way is that where there are strong, well-developed neural pathways, the impulses travel more quickly and require less conscious thought. It’s easier to walk on a well-traveled road than it is to break a trail through the woods. Thus, the art of the pause. As a coach for almost 13 years, I have mastered this fairly well in my one-to-one work, even though like many of us, I started out wanting to fix things for people. But I am realizing that as a leader, I am often not as good about it. At BEabove Leadership, we co-lead most workshops. I am the director of research, and bring to the table both an insatiable fascination and deep experience with neuroscience at an academic level. I spend a lot of my time speaking and writing about it, and honestly, at this point it’s easy for me. I have such deep and well-developed neural pathways I can speak about just about anything at the drop of a hat. This is not necessarily intelligence; much of it is experience and practice. Which I got by doing it. Over and over again. When I am teaching a class with another leader, I am noticing that because my impulses fire so quickly, I generally have the answer a beat or two before my colleague. So of course, I tend jump right in, leaving them, inevitably, with the second word and rarely the first. It’s humbling to realize that when I do this, I am robbing my co-leader of the chance to develop connections in their own brains and thus create for themselves ease and mastery of the material. 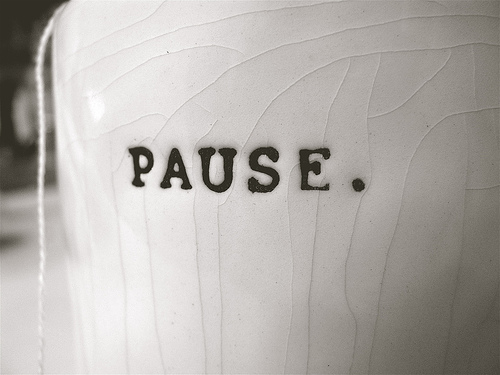 So for all of us who ever work with people who are learning to present new material, from speaking in a meeting to teaching a class, I believe it is critically important to grant more pauses. They need us to allow a bit more space and time for connections to fire. It’s easy to make the assumption that the reason the other person isn’t speaking as quickly is that they lack either knowledge or confidence, but this may not be true. It could be that their connections just aren’t as quick as yours (yet), and they need you to allow a beat for the synapses to fire. I’ve recently had the good luck to be on both sides of this situation. We are currently in the process of training new leaders for BEabove, where I have a lot of experience, and leading “front of the room” for CTI, where I am fairly new. I can feel the difference in the speed of my response. At BEabove, I know before a student in class is done speaking exactly the point I want to make and where I want to take their question. In CTI classes, I am definitely slower—not because my knowledge base or innate confidence are less, but because I simply have less experience teaching the material in a classroom setting, and less experience with the specific curriculum. And so, in my BEabove classes, I am working to intentionally allow more space for my new co-leader, so that there is time for his or her synapses to make a connection. It’s not a lot, honestly—maybe a second or two at most, but it makes a difference. I’m also looking specifically for what are the easy entry points for my new co-leader; that is, places they feel especially confident and ready to take the lead. And at CTI, I am beginning to design with my more experienced partners the grace of a pause for myself. It’s also important to know that for those of us who are new, we do need to push and challenge ourselves to step up and take the ball even when we don’t feel as comfortable. The way to become more masterful with the material is to try – and fail – and try again. And the result? The class or meeting gets exposed to more diverse thought and therefor a richer experience, and the process of mastery is accelerated for the learner. And what about the more experienced leader? Well, we get a wonderful lesson in patience and trust.